First you look at a job and think well that seems simple enough – fit RABScreen air intake filter screens to protect the low-level plant area from routine debris and local construction dust. However, the filters could not be fitted on the outside of the grille for aesthetic reasons. This meant that the welded steel grilles would have to be removed. The top of each grille is 4m off ground level and it was secured with 16mm cap head bolts into the funnel framework. Luckily when you deal with RABScreen and its partners nothing is really a problem. 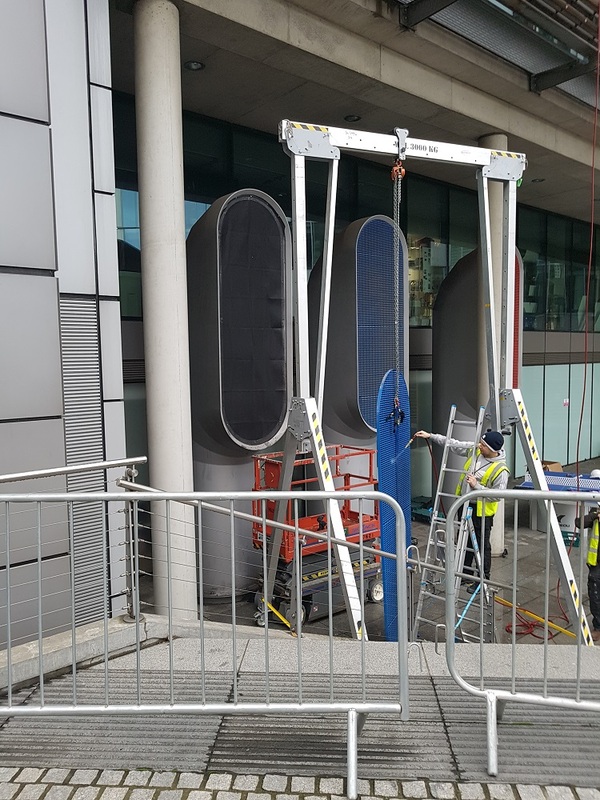 With years of experience in solving access issues, Richard Betts organised a 4m aluminium porta-gantry and a Skyjack motorised scissor lift. Simon Dennis, of partner company Blue Sky Cooling, was IPAF trained and used a working harness and lanyard to remove the bolts. Lifting hooks and strops were purchased to support the grilles whilst the bolts were undone. Permatron manufactured elongated filters to match the shape of the funnel. The rest was simply time-consuming history as each one of the 16 intake grilles was removed and cleaned to allow the RABScreen filters to be fixed into position. What happens next? The filters have a guaranteed life of ten years and can be cleaned by vacuuming in position. This can even be done without removing the grilles. A job well done by a professional team.